You have to wonder why there are so many types of electrical plugs in the world. It’s a pain in the neck that Trendnet remedies by providing three swappable plugs: One for use in the UK, one for use in the rest of Europe, and one for North America. 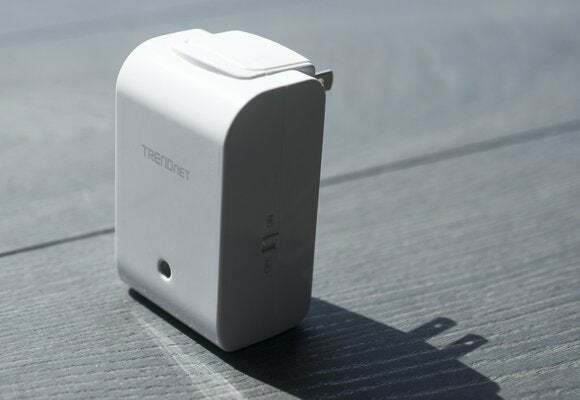 Since most other countries use one of those three types of adapters, Trendnet figures its router can plug into 90 percent of the world’s electrical outlets. The router itself is relatively small; think of a slightly oversized wall wart. It plugs directly into an electrical outlet, much like the Netgear Trek and the TP-Link TL-WR710N. It can operate in one of three modes: As a wireless router connected to a DSL or cable modem or a hardwired network; in WISP mode, connected to a Wi-Fi hotspot; or as a repeater to extend the range of an existing wireless network. You slide a button on the side of the device to choose which mode you’d like it to operate in. 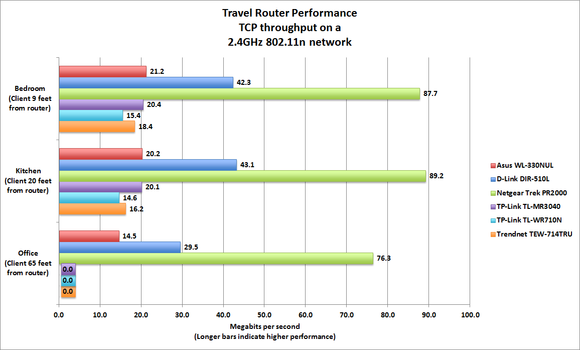 Trendnet's TEW-714TRU finished next to last in terms of TCP throughput. The second USB port is used only for charging small devices, such as a smartphone, tablet, or media player (it will deliver between 1.1- and 2.1 amps of power). There is no provision for using a 3G, 4G, or LTE USB modem with this router. An on/off button on the other side of the router lets you turn off the router’s network function without disabling its USB charging function. 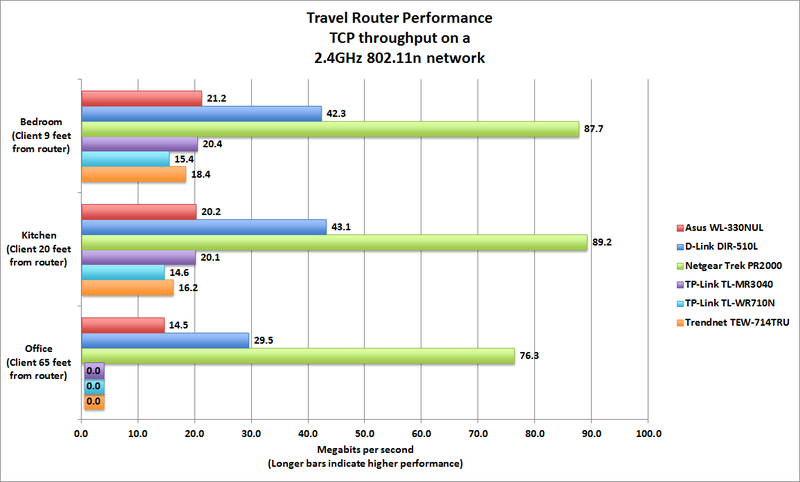 Like most of the other travel routers in this roundup, the TEW-714TRU supports the 802.11b/g/n standards, delivering one 150Mbps spatial stream on the 2.4GHz frequency band. The router comes from the factory preconfigured with a secure password, and its default SSID, network password, and admin login and password are printed on a label that gets hidden the moment you plug the router into the wall (because it’s on the same side as its prongs). A WPS (Wi-Fi Protected Setup) button on the side of the router simplifies the process of adding clients to its wireless network, but you’ll still need to know the admin login info to access its user interface. In terms of performance, the TEW-714TRU is way in the back of the pack, but it's faster than the last-place TP-Link TL-WR710N. At close range, with the client nine feet from the router and in the same room, it mustered TCP throughput of just 18.4Mbps. The first-place-finishing Netgear Trek PR2000 hit 87.7Mbps here. The Trendnet finished next to last when the client was in the kitchen, 20 feet from router and separated by one wall, delivering TCP throughput of 16.2Mbps. It wasn’t able to sustain a connection at all when I moved the client to my home office, which is 65 feet from the router and separated by several walls. The TEW-714TRU’s power tips will benefit frequent world travelers, and its ability to charge mobile devices and share files from an attached USB storage device are attractive features. But this router’s Wi-Fi performance leaves a bit to be desired. Exchangeable power tips make the TEW-714TRU is a good choice for world travelers, but its performance leaves something to be desired.